My darling husband recently gave me some pink tulips and I thought I would photograph one of them for Mosaic Monday with Mary from Little Red House. I wanted to capture the transition of light. The stillness and elegant simplicity of this tulip almost gives you an emotional perspective. I hope you have enjoyed the dreaminess of this delicate, lovely blossom. Breathe in the beauty of springtime! Love tulips. The pink ones are so pretty. Love yours pics. A very pretty shade of pink Donna. I read your previous post and enjoyed the interview. I'm just back from a long weekend in Buffalo where I found the amazing Hobby Lobby - wow! I bought a number of stamps there and a beautiful paper package featuring butterflies. you have taken gorgeous photo's of this tulip donna. Beautiful. I love tulips and these are just gorgeous. Great photography. 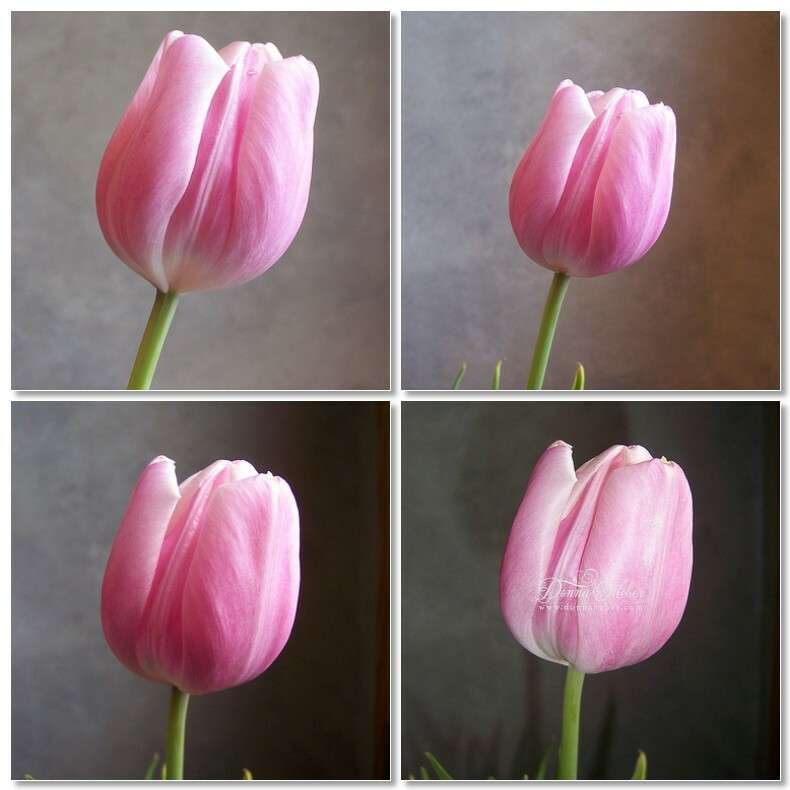 The tulip is gorgeous and you caught each photo with great skill. Truly enjoyed your sharing moment. Your Tulip Mosaic is lovely, my Tulips have yet to bloom this year, they are trying, but I fear it has gotten too hot too early and now they may not manage it. How pretty! You've really captured their essence, Donna. They are such a fleeting example of spring. I wish ALL our blossoms could last a little longer. Lucky you ... such a sweet husband you have! Great pictures! What gorgeous tulips and an intriguing way to present them. Beautiful color...great images. Your pink tulips are amazing! Love your mosaic. Thanks for your visit and have a lovely week.